Me, Beloved, and Const tried out Project Pie for dinner. This is a hot place for foodies being a build-your-own pizza place. What made it hot was the claim that you can put as much toppings as you could possibly can on their pies, hence the “Project” bit. It was a bit inaccessible for Beloved and I alone, as we didn’t have an auto. But with Const, it was a pretty unmissable place to the right side going southward from EDSA. The place was packed and the queue quite long. It promoted a communal approach where you sit wherever and encourages you to sit with strangers. It was actually more of a hassle for an odd group like us because of the lack of vacant seats. 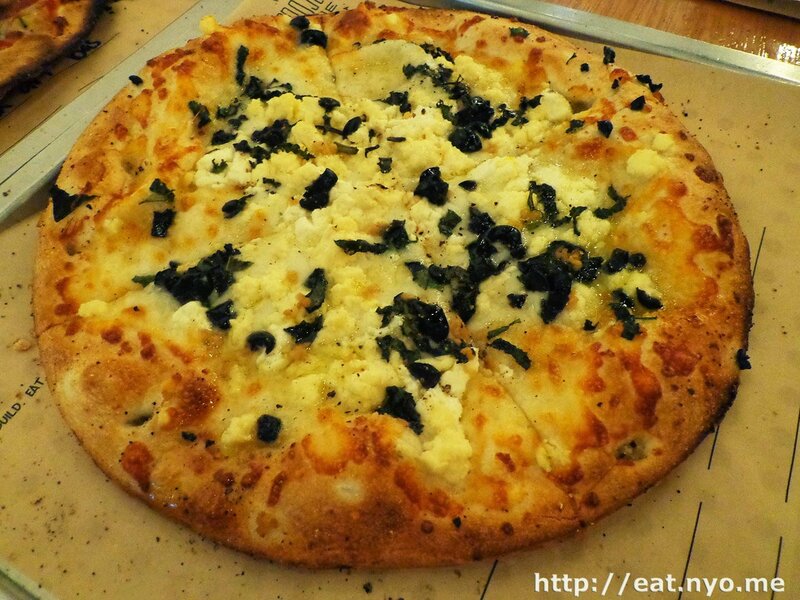 Anyway, as I mentioned, you can build your own pizza using the toppings they offer to your liking at 285 Php per pie. However, they do also offer numbered menu items with preselected ones at a similar price. I ordered their #5, as it seemed to tickle my fancy. I also built one of my own over a red sauce, complementing the #5’s white. I made sure I didn’t build a gluttonous mountain of toppings like the person before me, which was sadly possible to ask for in this place. Beloved also made her own pie, and Const ordered one of their preselected ones and also made one of his own. 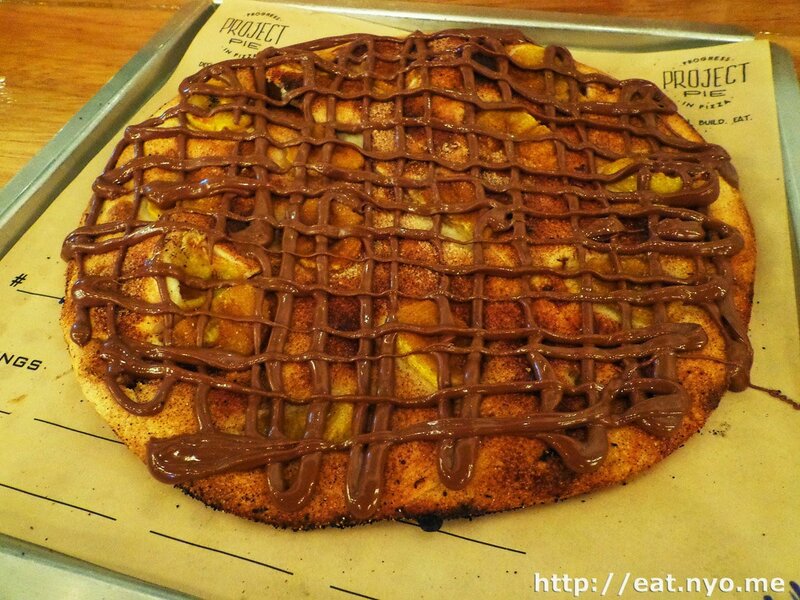 Beloved also ordered their Banana Nutella (145 Php), which was simply a dessert offering over their pie crusts. We also ordered Iced Tea (65 Php) which you fill your own from their different iced tea flavors and comes with a one-time refill. Above was their #5. This was a simple offering of four cheeses–mozzarella ricotta, feta (because they were out of gorganzola that night), and parmesan over white sauce and freshly cracked pepper, olive oil, garlic, and basil. I did some modification by adding black olives. It was a very rich and creamy dish, the four cheeses certainly the star of the dish, and my olives adding a hint of saltiness. My original creation had mozzarella, prosciutto, anchovies, mushroom, artichoke, and black olives over red sauce. This creation was a bit on the salty side, especially with the anchovies and prosciutto, but was somewhat balanced with the mushrooms and artichoke. 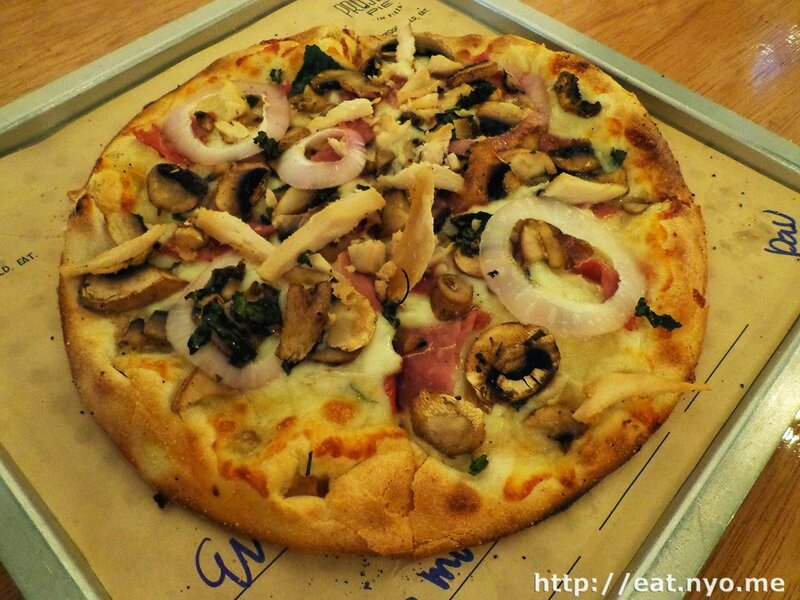 Beloved’s creation had mozzarella, prosciutto, mushrooms, red onions, garlic, chicken, and chopped basil over white sauce. Beloved commented it being a bit on the herby side. Finally, Beloved’s Banana Nutella was somewhat of a regret. The pie was entirely sweet, which was a very unexpected taste over a crunchy crust. Now, I didn’t mention a lot about the crust aside from it being crunchy. Another property it exhibited was being very, very hefty. Const and I are pretty big eaters. Given enough time, we can finish three of these similarly sized pizzas, which were somewhere between eight and ten inches in diameter, easily from other establishments. 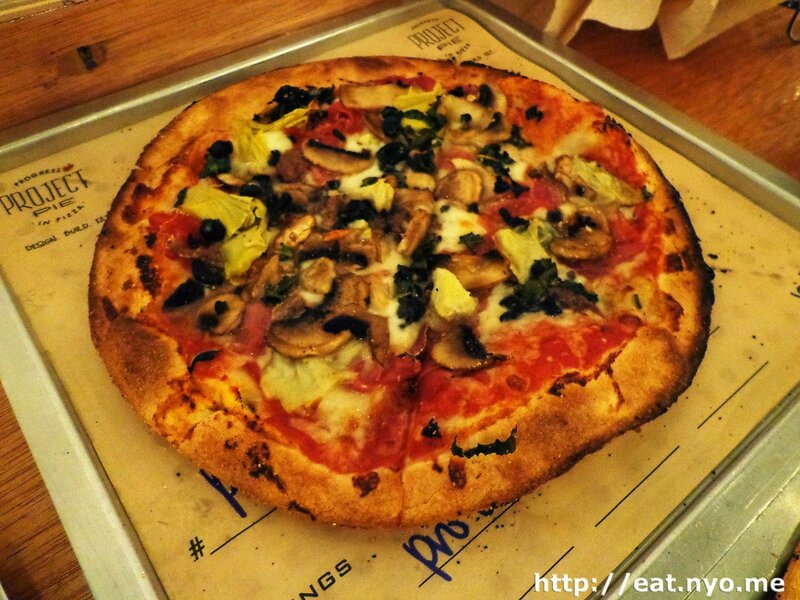 However, Project Pie’s crust, despite being thin, was definitely filling. This is one of the few places where I actually got full in under 1000 Php. We went home with regrets that we ordered two pizzas apiece. We had to take home most of Beloved’s Banana Nutella because there was simply not enough space in our stomach. It’s good to know, however, that this place is available if you’re hungry. But the “create-your-own” part was not really as exciting as we originally thought because of a couple of reasons: first, there was simply a limited selection of ingredients, and secondly, the servers just randomly place what you point over the pies, without any art whatsoever. In addition, the ingredients, while some might sound fancy like prosciutto and feta, over pizza does little difference to the final dish as a whole. Still, it was an interesting trip. I’d definitely recommend a visit. with much stress on “a”. I might go back to Project Pie, but I’d definitely not be the one initiating invites to my friends. Not recommended for: Carb watchers. Smart nomnomnom tip: Don’t make a mountain out of the available toppings; keep your pie nice and flat.